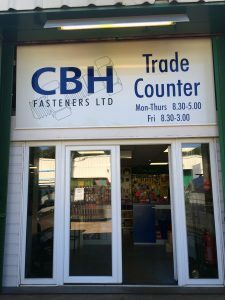 CBH Fasteners Ltd first traded in Redditch in 1983 as a supplier of fasteners and fixings, set up by Colin Bevan and Bryan Harvey – hence the company’s name which comprises their initials. Their business operated from behind Colin’s house, in two garden sheds. The company was bought in 2004 by Martin Jackson and continued to trade from Colin’s garden until they moved to their current premises on Bartleet Road in Washford Industrial Estate in Redditch in 2009. Jill Marshall then took on the running of the company and since then has extended the range of products to a full complement of fasteners and fixings in both imperial and metric, a wide range of tools, abrasives, PPE, consumables and much more to meet the full needs of the engineering and construction trade. Partners include well known industry names like OwlettJaton. Jill’s daughter Emily joined the company in 2010 as a Business Manager and has fitted in very well, demonstrating her mother’s good business sense. Having done very little with computers and as the company grew, Jill and Martin took the step to order the Sharp-aX business system from Sharp-aX in Berkhamsted in Hertfordshire, in June 2014. It has been a huge success. Jill has reduced her workload by three weekends per month and the team particularly values features such as purchase quotations and the absence of the need for paper copies across the system. CBH Fasteners has dramatically improved customer service, especially on the trade counter where Jill and Emily can set the system to optimise product sales. Features like visibility of outstanding orders in purchases and sales as well as the time and accuracy of monthly invoicing have been hugely beneficial to the business. Jill says that implementing Sharp-aX has enabled stability and continuity of pricing. At the press of the button she is able to find out what a customer previously paid for an item and also what her purchase price was, which is an asset when negociating.